Featuring a unique raised setting with the unique "Royal Crown" design, this beautiful diamond semi-mount features a shining solid metal band that tapers as it approaches the pear-shaped side diamonds. Sparkle and shine create a beautiful effect that with each glance, will remind her of you. Fine, thin, strong prongs of fine metal hold the gemstone securely in place. 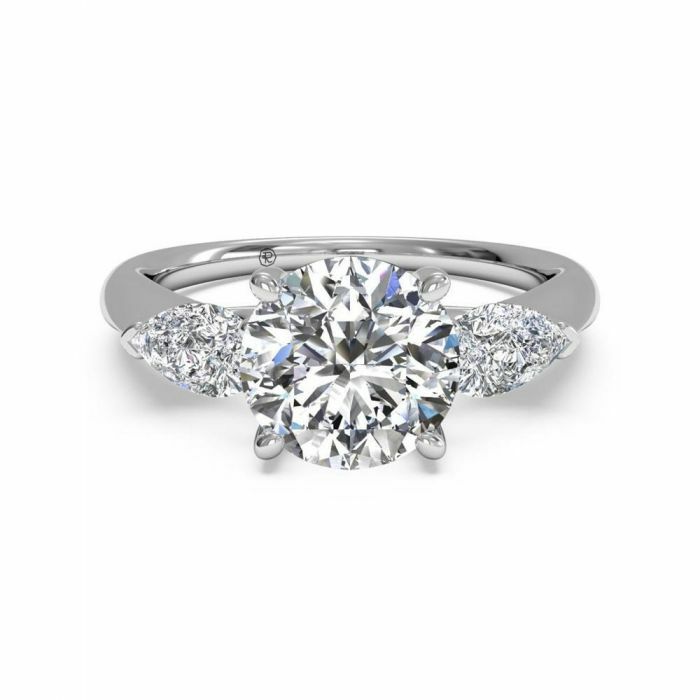 This classic setting allows for maximum light to enter the stone through the sides and bottom for maximum sparkle. The prong-setting is strong and secure, and allows more light to enter your gemstone, creating more brilliance. Diamonds are 3/8ctw, H or better in color, and VS in clarity. This 14k white gold semi-mount comes with a 1ct round cubic zirconia that can be replaced with any stone of the same proportions. Diamond Clarity: VS1 - VS2Clarity: An industry term describing the number and density of inclusions and blemishes within a diamond or gemstone. See our Education section regarding the 4 C's for detailed information.